Each year the EPSC (European Process Safety Centre) awards a prize to an individual, team or organisation working in the process safety field for making an exceptional contribution to the advancement of process safety. This year the 2018 EPSC Process Safety Award was presented during ACHEMA to Dr. Hans-Peter Schildberg of BASF SE, for his outstanding work on detonation resistant process design. His presentation given at ACHEMA on "Gas Phase Detonations: Effective Pressures Acting on the Walls of the Enclosures and Probability of Deflagration-to-Detonation Transition in Pipes, Vessels and Packings" can be found here. 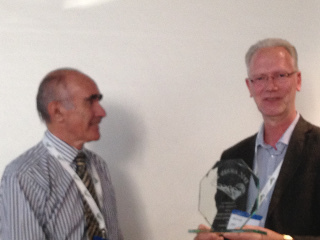 Dr. Hans-Peter Schildberg (right) receiving the award from Piet Knijff, chair of the EPSC Board. At the autumn meeting of the EPSC Technical Steering Committee, the EPSC Award for 2015 was presented to former EPSC technical director, Richard Gowland in recognition of his extraordinary lifelong contribution to the field of process safety. Richard has had a long and varied career in process safety, including 30 years at the Dow Chemical Company, independent work as specialist in safety instrumented systems, and risk and hazard analysis. He has shown his merit in everything from training courses to major incident investigations. Following the oil depot fire at Buncefield in 2005 he was invited by HSE, the UK regulator, to chair a group which published guidance on LOPA for fuel storage sites. This work significantly advanced the use of LOPA methods in practice. Since retiring from EPSC last year Richard continues to be active in process safety and remains as the Course Director for delivery of the IChemE LOPA training for both its in-company and public courses. For these achievements, and many others great and small, EPSC has chosen to recognise Richard Gowland's unique influence in improving the theory and practice of process safety. The EPSC award celebrates and highlights the achievements of those who work towards a safer Europe.